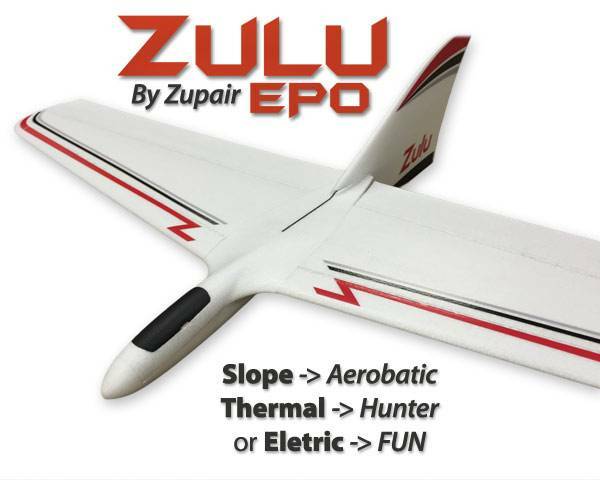 The Zulu is a very unique plane that features "Drooperons" on the leading edge, these provide much improved lift and aerobatic capabilities that you have to fly to fully appreciate! 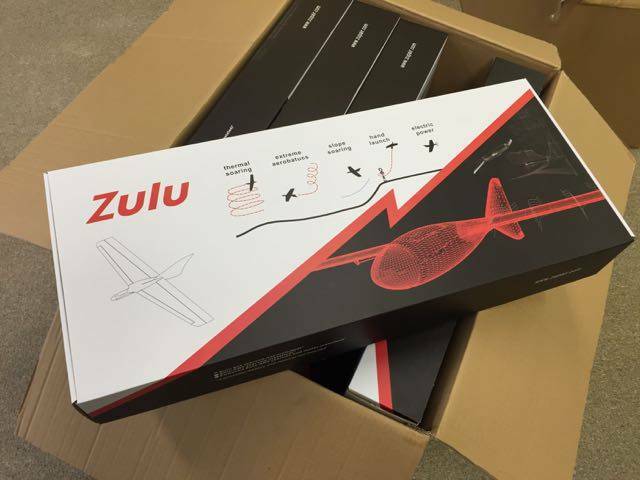 Thanks to the drooperons and the overall design the Zulu is hard to classify, it is a slope glider, a thermal glider and can also be electric powered. How can I explain the Zulu? 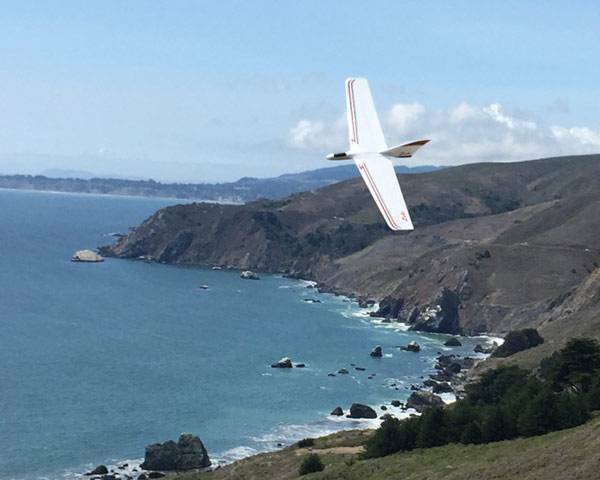 First I should tell you this is a glider that has some very unique flight surfaces. The Zulu incorporates "drooperons" on the leading edge. These surfaces are the key to the wide flight envelope and smooth aerobatics. While drooperons may not seem that new to you, these are a completely new approach, and the results are amazing. The drooperons work in conjunction with the elevons to increase lift in thermal activities, and also increased aerobatics. All of this is done with just 2 servos. How does all this work? Here is a link that explains how the drooperons on the Zulu work. With drooperons installed, the Zulu can reach a much higher lift coefficient, ~80%, before stalling, both right-side-up and inverted. 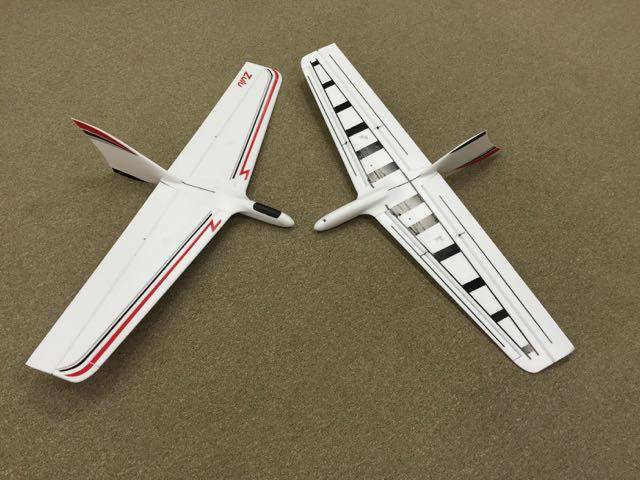 This allows for tighter turns, loops, a lower sink-rate, and slower stall speed. The drooperons are also effective at increasing roll-rate, especially at low speeds. With drooperons, the Zulu is also more stable during the deep-stall maneuver, making landings and altitude control easier. So what do you get with the Zulu? It is intended to be able to fly in very light lift conditions, but still be fun to fly. Not only will it soar when other planes can't, but it will make the most of the light lift and allow you to have fun. The Zulu can be tip launched for added height, yet it is very much at home on the slopes. Beginners and advanced pilots alike love this plane! The Zulu has gone through many prototypes and at least 3 different production versions before this EPO molded version. The EPO version is by far the easiest to build with typical build times well under an hour. Just install your radio gear and glue on the tail. Very detailed instructions are included, so even someone that hates to build should have no issues with this one. The wings are removable via the twist of a screw and unplugging the servo leads, this is great when transport space is tight. We have been flying these in a wide range of conditions from a mouse fart up to about 25mph at our local slopes. Pilots of all levels have been enjoying the flight performance. They plane is perfectly happy to make lazy turns in the sky, or turn it up and go crazy doing VTPR style maneuvers right off the deck. That is what makes the Zulu so great, it is very versatile! Power Option - Yep, she even has a firewall installed below the lightly glued nose cone. There is a power package available, see the associated products below for that item. Light wing loading of 4.6 oz/sq.ft (14.1 gm/sq.dm) means she can float when needed. 5. Two 12" 26 awg servo extensions. Sorry can not ship to the UK, Australia or Germany. Please see your local distributor. Please see the highly detailed instructions for all specs.